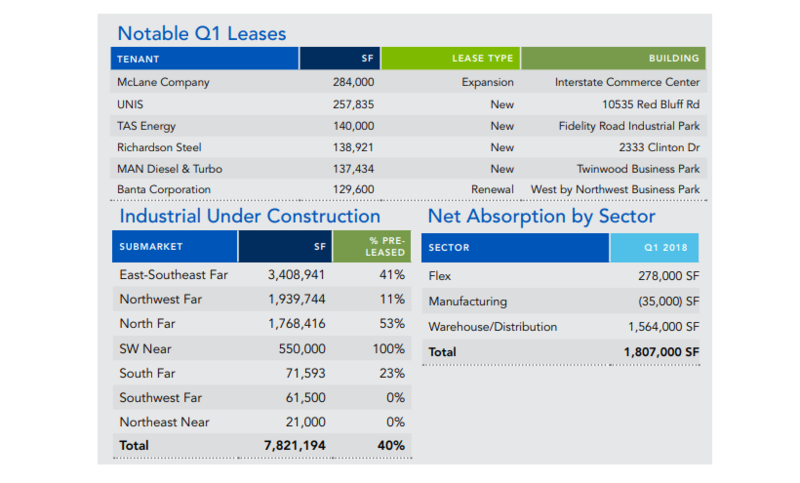 ​​​​HOUSTON – According to Transwestern’s 1Q 2018 Houston Industrial Market Report, the industrial market continues to move full steam ahead as vacancy rates remain extremely tight and the construction pipeline remains robust. Absorption in first quarter was driven by preleased deliveries as 84 percent of the 2.1 million sf delivered to the market had commitments. Amazon’s 1.1 million-sf distribution center in Katy was the largest project to deliver over the quarter and is currently supplying 400 new jobs in the market with the potential for over 1,000 jobs.